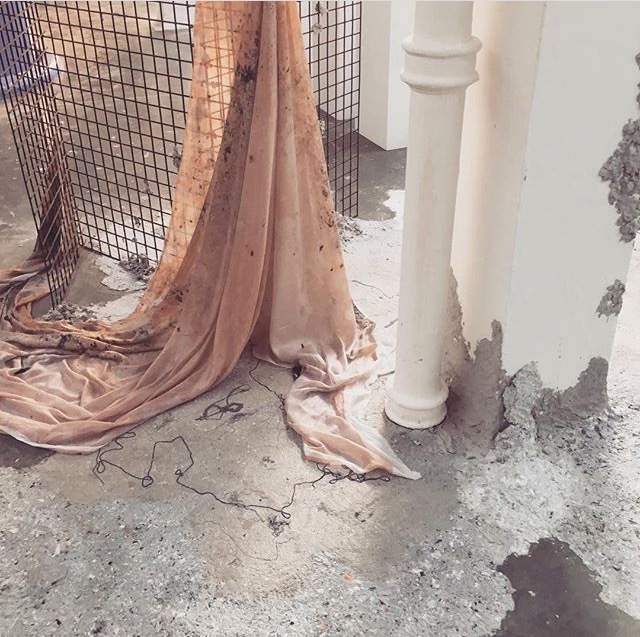 On the first Monday of Camberwell’s MA Conservation and Undergraduate Summer Shows we host a prize giving to celebrate the achievements of our students over the past year. Below is a run down of this year’s awards and award winners. 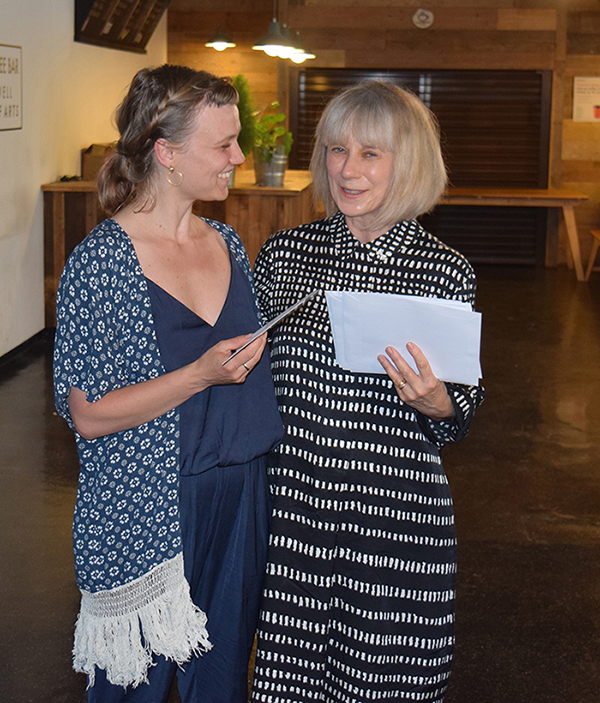 The Harry Crisp Award is given to Camberwell College of Arts students who can demonstrate that they have worked with local community groups and individuals. Harry Crisp was a former academic member of Camberwell staff. Funded by CRAFT (Craft Residential Arts Fellowship Trust), this year Rosemary Hill, trustee of CRAFT presented the awards. The runners up this year are a group of Drawing students, Nathan Frazer, Mathilda Hartland, Jiayuan Li, Alexandra Mowinski, Cherish Coupland and Vojtech Nozicka. 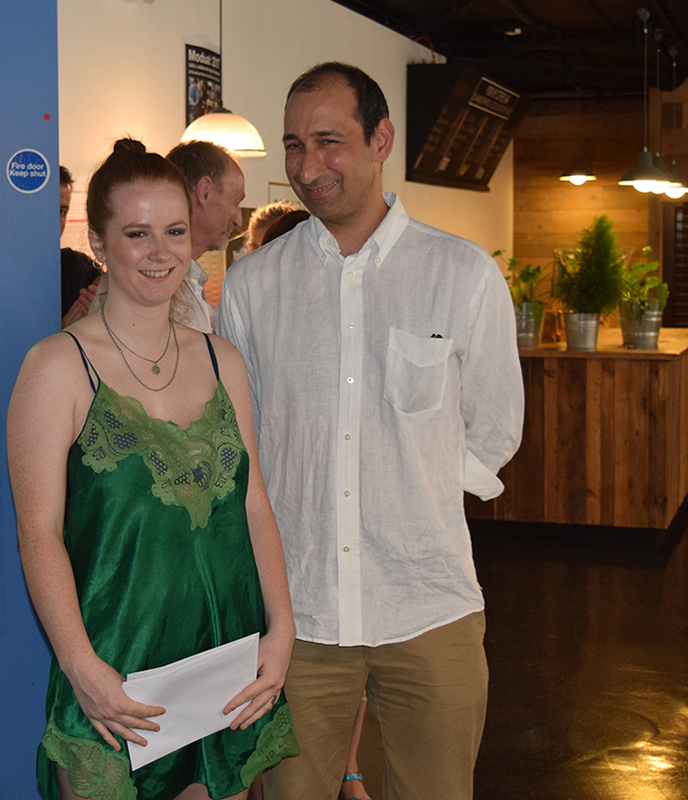 Second prize went to Nora Schmel an MA Visual Arts: Book Arts student and the winner of the Harry Crisp Award is Lorena Pritchard a BA Sculpture student. Nora is “very pleased to be selected for the award!” Nora was selected for the Harry Crisp Award as she is currently collaborating with a Peckham based, non-profit organisation, Super Yonic, to design and produce their publications for their coming event in August. Super Yonic is an arts festival designed to bring together the brightest creative talents for three days to celebrate women in the arts. Nora’s part in this relationship is to create a publication to support the initiative and highlight the importance the role of women in art. You can follow Nora on Instagram here. Lorena applied for the award as she has dedicated her spare time to volunteering for Arts Sisterhood UK. Arts Sisterhood is an organisation providing cheap art therapy classes for self identifying women, organised by founder Alice Strick, who also runs classes with the help of supportive volunteers. Lorena’s role has been to support within the classes, held at D.I.Y Space For London in Peckham, and also helping with curating the classes as well as coming up with ideas for new classes. Lorena would be very interested in curating an exhibition of works made by Arts Sisterhood once more pieces have been made. You can read Lorena’s profile and see what work Arts Sisterhood is involved in on their website. The winners of this award are chosen by course staff Duncan Wooldridge, Bernd Behr and Richard Smith to acknowledge engagement in technical enquiry. The Award guarantees 100 hours of access after graduation to the photography technical facilities at Camberwell. The winners, all from BA Photography, are Zerrin Asir, Felix Caceres Suarez and Shi Bo-Hao. Zerrin was selected as she has applied a very high standard of execution and attention to detail within a digital methodology. In working through digital printing and its post-production workflow, Zerrin has demonstrated independent experimentation of surface and material type, saturation and installation. Felix was selected for the Photography Technical Achievement Award as he displayed a very significant ability to work independently through the creation of his work, proactively setting himself difficult projects and problem solving to produce interesting and increasingly sophisticated solutions. Felix successfully navigated through various technical challenges, researching and experimenting different approaches assessing the results and altering his methods to suit new sites and new conditions. 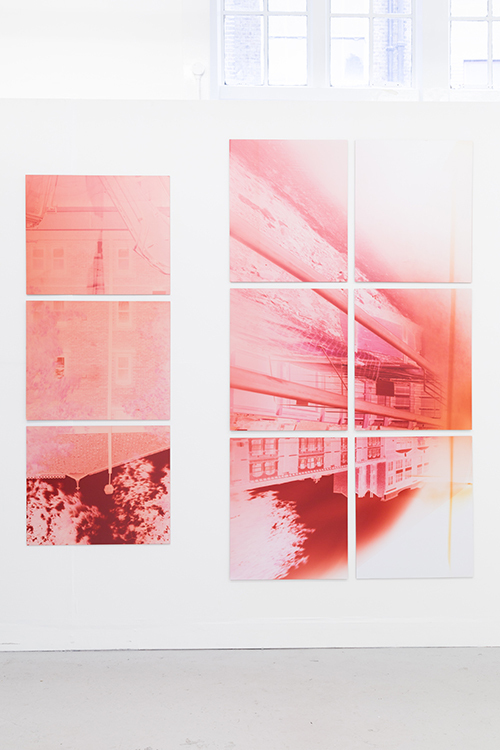 His work is uniquely sensitive to light as a photographic material, and he has displayed a concern for site-specificity that is unusual and difficult to achieve within photography. Shi Bo-Hao was chosen as he has developed an impressive cross-media installation that retains a consistent approach and control of aesthetic, whilst exploring delicate and philosophically rich subject matter such as place and the void. He has independently worked through technical ideas and hurdles, producing photography, video, and sculpture, before producing room-size installation, presenting new technical challenges, where he has collaborated very effectively. He has been consistent in his image making retaining a keen eye for detail and technical standards, even whilst using low-resolution photographic tools. Shi Bo-Hao, “just wants to say thank you for all the help from my tutors and technicians.” You can see his work on his website. 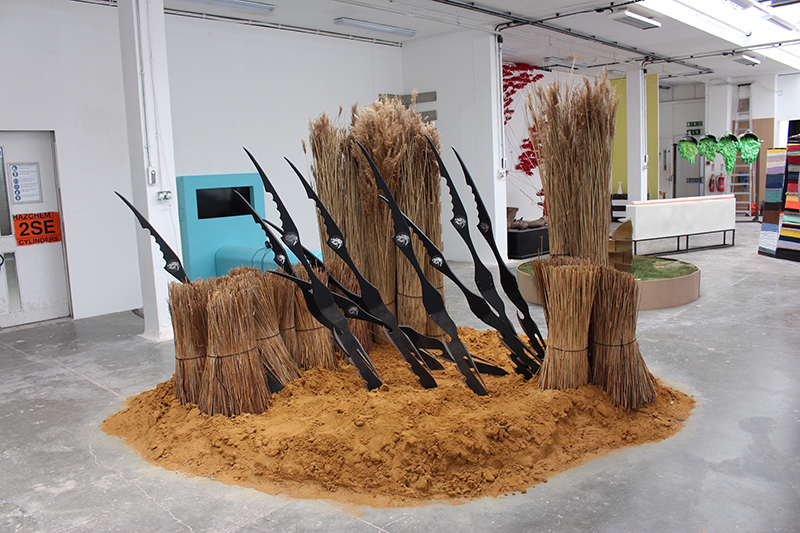 The Camberwell winner of the Landmark Award is Victor Leleca from BA Painting for his installation ‘Animols’. Associate Dean Amanda Jenkins awarded Victor with his prize. The piece is 12 paintings and sculptures based on a fictional and abstracted version of the 12 Chinese zodiac animals. Some of the 12 animols were made with the studio space in mind, for instance the tallest one called ‘hors’ and the large green ‘drakn’ on the wall. Victor had this to say about winning: “The prize came as a huge and pleasant surprise. It is definitely a positive encouragement and a great financial support for future projects.” You can view more of Victor’s work on his website. 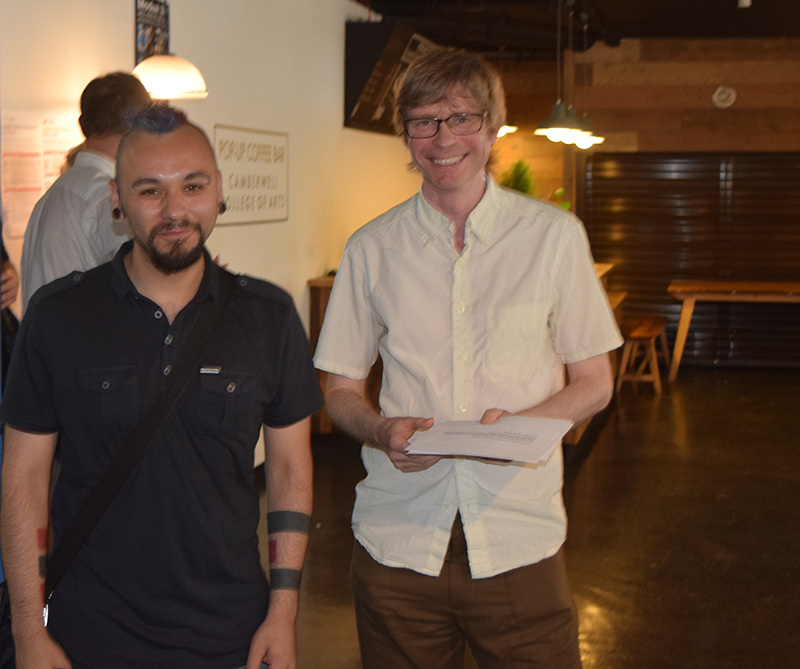 Awarded in memory of Marius Dean to a student of BA 3D Design or MA Designer Maker to support a travel proposal which will help to further creative practice. The intention of the bursary is to expand, enrich and explore your practice through the opportunity that travel affords you. The key rationale for travel should in some way relate to making and or materials and it is hoped that this may be dovetailed with an exploration of cultures and groups in society. 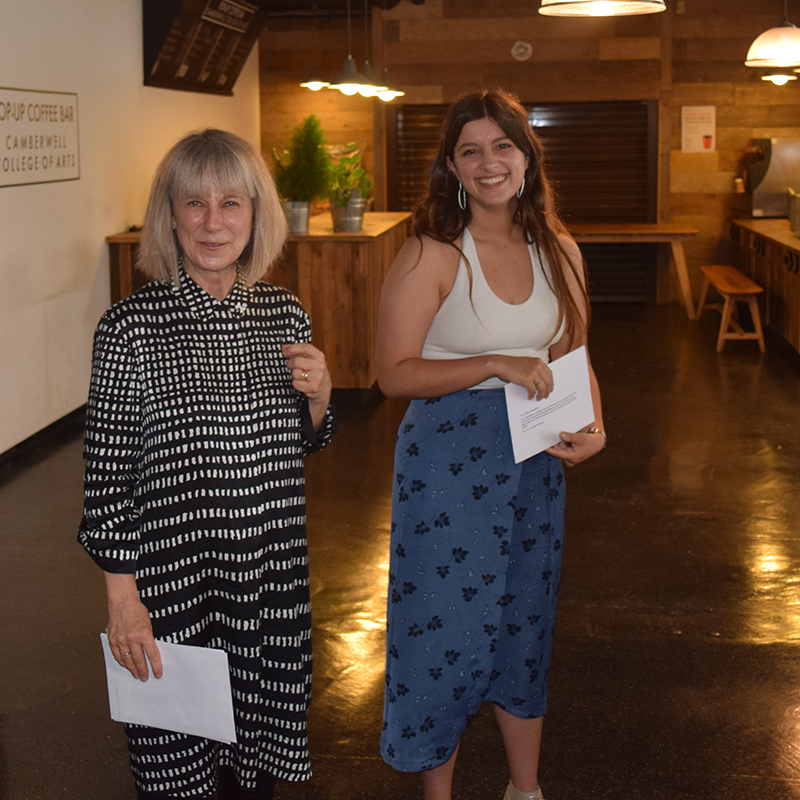 This year’s Marius Dean Travel Award was presented by Marius’ sister Zana to BA 3D Design student Natalia Kasprzycka. 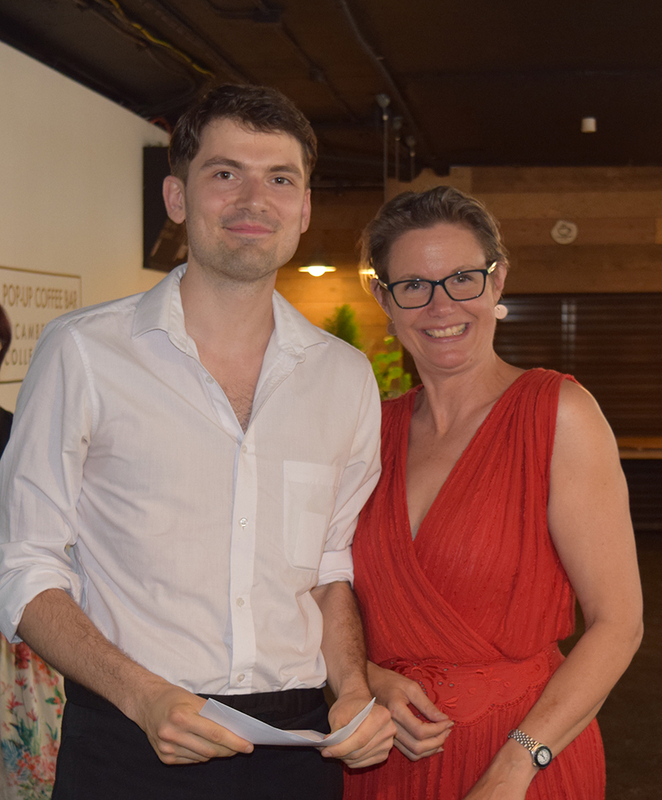 Unfortunately Natalia was away on Erasmus during the prize giving, so Acting Course Leader for BA 3D Design, Michael Hurley, accepted the award on her behalf. The bursary will give Natalia the support to carry out travels in preparation for her third year work next year. Natalia told us about her proposal and plans for the travel award. 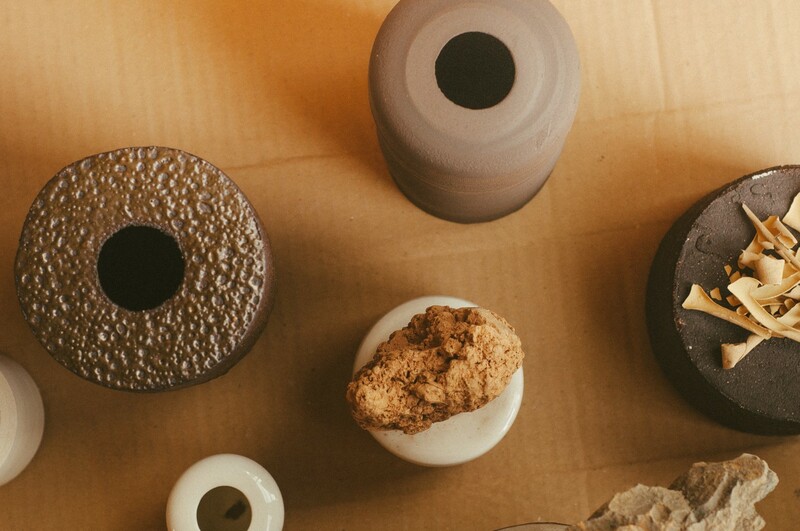 This prize is awarded to a graduating students of Fine Art at Camberwell. It offers a rent-free studio for a year as well as continued access to the college’s resources. 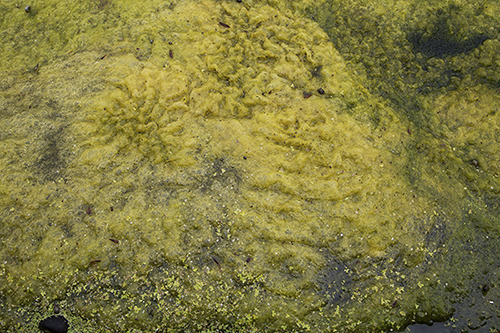 The award culminates with a solo presentation of work at Camberwell Project Space. 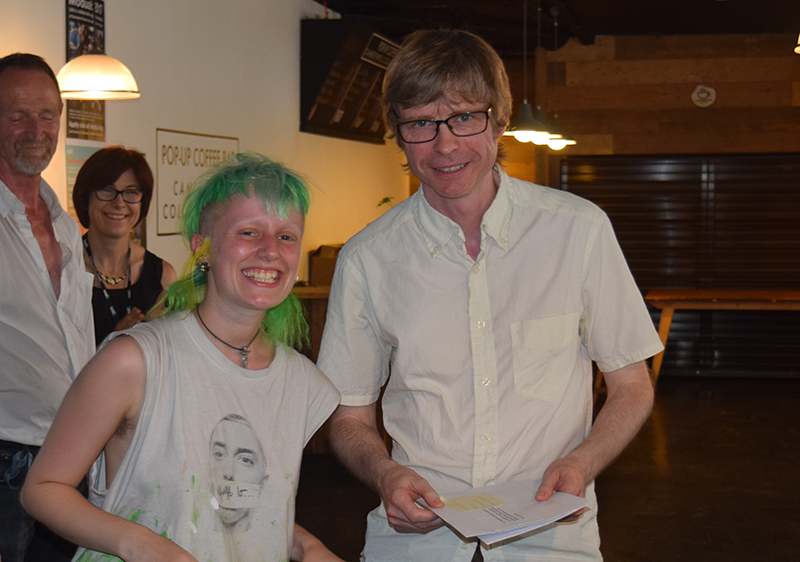 BA Sculpture student Rosie Grace Ward has been awarded the Vanguard Prize by Jonathan Shaw from Vanguard Court. Featured image at the top of this post is ‘Animols’ by Victor Leleca installed in studio for his degree show 2017.